Hello! The weather has turned cool here in Ohio but the leaves are just beginning to turn color. I decided to create a card using the colors from the Inspiration Palette Challenge 01718 at The House That Stamps Built and the sketch from Stamp Ink Paper Challenge #172. Instead of stamping leaves for my card, I used an entire tree of leaves. I stamped Repeat Impressions Shade of the Elms stamp with Memento Toffee Crunch ink on watercolor paper and water colored the image with Distress Oxide inks Twisted Citron, Wild Honey, Spiced Marmalade,Vintage Photo using all the colors in the color palette below. I trimmed the image in a pentagon shape creating my own template for the shape. I place this on a mat of the same shape in Brown CS. Attached this to an ivory card base and added strips of brown CS instead of using a background layer. The GKD sentiment was stamped in Vintage Photo ink to finish. Note: When I posted the photo the sky appears blue in the image. It is only the natural color of the Watercolor paper since I did not ink the sky area or use any blue. Do not know why it looks blue. The House that Stamps Built: Challenge 01718. Used all the colors of the palette. 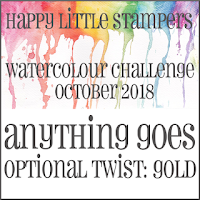 Happy Little Stampers: October Watercolor Challenge Anything Goes, Did not use the optional twist. 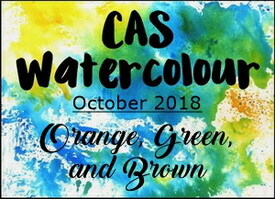 CAS Watercolor Challenge: October challenge Orange, Green, Brown. That chair looks like the perfect place to rest and relax and enjoy the gorgeous colours of fall! Love your autumn scene, Theresa. So pretty in the framed shape. Thanks for sharing with us at CAS Watercolour! Simple and beautiful!! 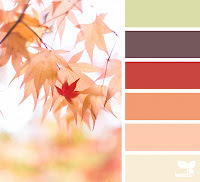 I used that same image for my card last week; love how you colored the leaves! Thanks for playing with the House That Stamps Built. 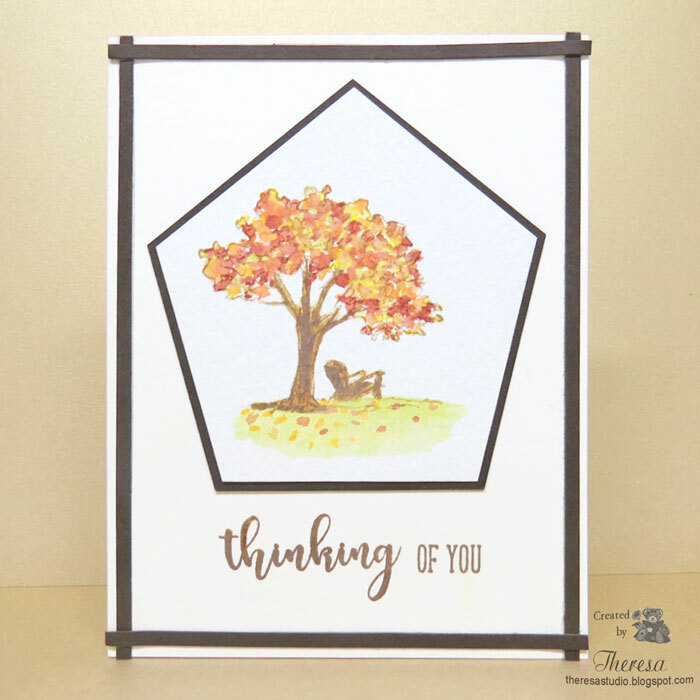 I love how you used that RI stamp to create a beautiful card! 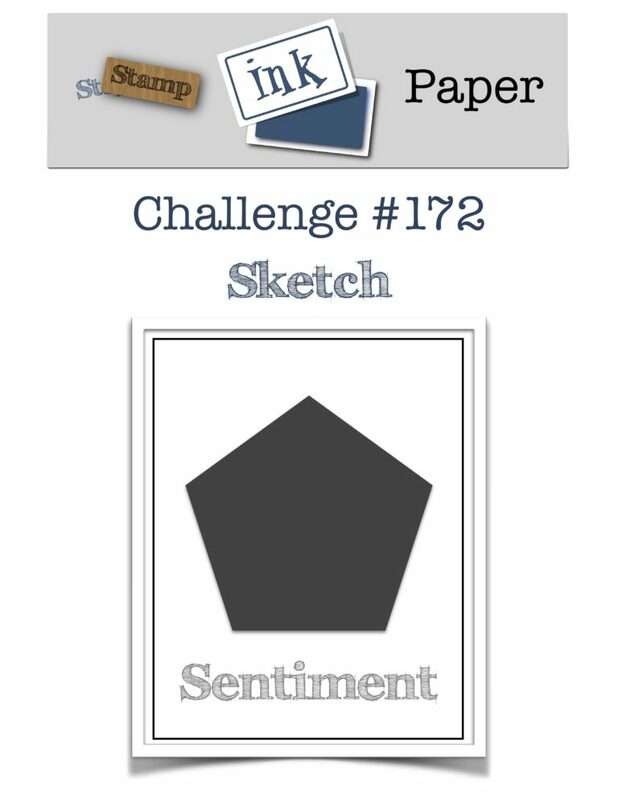 So happy you joined in the Inspiration Board challenge over on The House That Stamps Built! A lovely card with such a peaceful, serene look about it, Therese! 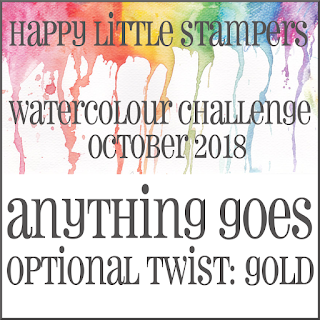 Thanks so much for joining us at HLS Watercolour Challenge this month. 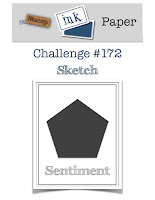 Thank you for joining the challenge at HLS Watercolor.